Brain cells communicate with each other through an electrochemical process. Every time you think, learn or communicate, a neuron (brain cell) in your brain sends a nerve impulse down its axon. The axon of one brain cell makes multiple thousands of connections with many thousand other brain cells. The point where one brain cell connects to another is called a synapse. When the nerve impulse (electro-magnetic bio-chemical message) surges down the axon, it is fired across the synaptic gap via a chemical messenger called a neurotransmitter into the dendrite of the receiving brain cell. The nerve impulse then travels along the axon of this brain cell, across the synaptic gap to another brain cell and so on. When a neuron activates (“fires”) another in this way, it’s like a switch being turned on. Neurons fire like a line of falling dominoes. This activity is the process that creates the intricate pathway of thought, also called memory traces or neural pathways. Neurons can either “excite” other neurons to make them function. Or they can “inhibit” other neurons so they don’t become active. Therefore, there are different types of neurotransmitters that either excite or inhibit other neurons. Neurotransmitters are found in the food we eat. That is why it is important to eat the right types of brain foods in order to improve the effectiveness and efficiency of your mental process. What happens when brain cells communicate? Neurotransmitters are chemical messengers which transmit the nerve impulse across the synaptic gap. 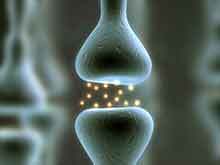 The synaptic gap is the space between neurons. Nerve impulses are transmitted from one neuron across the synaptic gap via the neurotransmitter into another neuron. The nerve impulse travels down the axon into the terminal button. The terminal button is the end of the axon and contains vesicles. The nerve impulse enters the dendrite of the receiving neuron.